While the Walden University Library aims to provide as much content as possible, we can't provide access to everything. Some items are not available in online formats. It's also difficult for us to develop a collection based on local issues, because our students are all over the world. Depending on where you live, you may have a number of local libraries—both public and academic—with readily available research materials. Get to know your local libraries. The more access points you have for research, the better your scholarship will be. Borrowing privileges vary widely. Check out the websites for the libraries in your area to find their borrowing policies, or contact the libraries directly. WorldCat is a combined catalog of libraries all over the world. 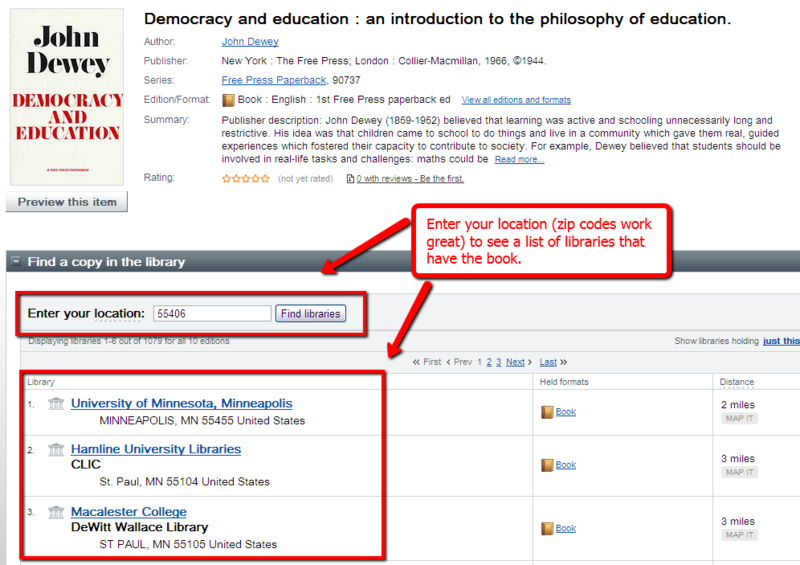 You can search for a variety of items then enter your location to see if local libraries have what you want. 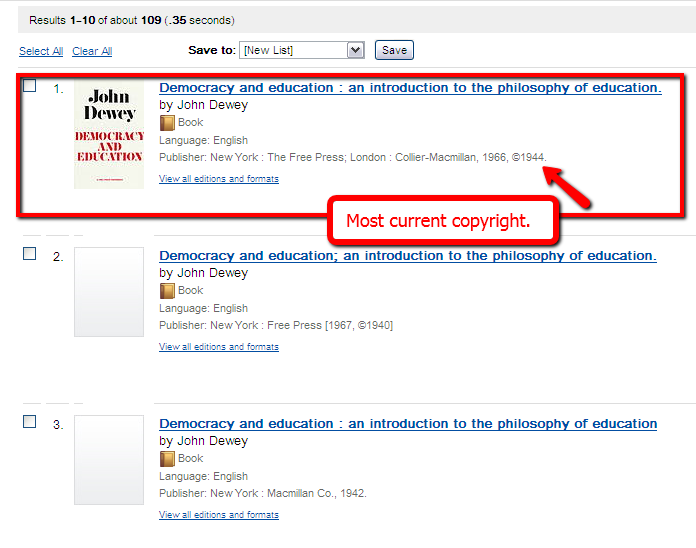 Let's say we are interested in locating the book, Democracy and Education: An Introduction to the Philosophy of Education, by John Dewey. Select the Books tab above the search box and enter the book title. Click search and look for the correct result. Tip: you may see several similar results, but you will want to select the result with the most current copyright. Click on the title of the book you want; on the following screen, use the Enter your location box located under Find a copy in the library to see a list of libraries that have the book you need. Tip: Using your zip code for your location works great. Select the Articles tab above the search box. Enter the title of the article in the search box. Under the search box, enter the title of the journal in the Limit to journal/magazine box. Before you visit the library, it's best to contact them to confirm that they have what you want and that you would have access to it.